Now I know I'm a little bit behind... but I didn't think I was several WEEKS behind. I'm finally getting around to showing this wonderfully sweet gift basket Miss Kathy of The Writer's Reverie gave to me on her visit to our area back in September. Doesn't it just look scrumptious? There's chocolate and tea and all kinds of goodies. And just enough pink to keep a pink nut like myself happy! I'm going to dive into my basket and turn up the music. That is a wonderful gift and I bet that chocolate is good..you have eaten, right? :0) Oh my, snow!!! You know I'm in the Tennessee Smokies. We had a lot of snow last winter and it's said that this year will be no different. It seems that the winter's are definitely changing back to the way they were in the 1950's. Fill your day with lots of PiNk Sparkly faerie dust! What a delightful gift. Miss Kathy, a fellow grandmother, is so sweetly creative! And I heard about the storm heading your way. Praying it won't be too bad. :) Have a lovely Pink Saturday. 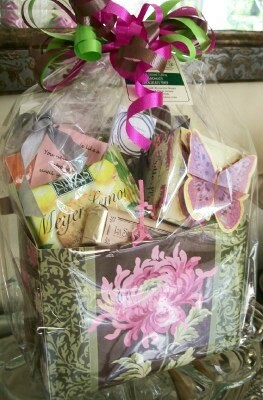 Lovely gift basket. Stay warm and enjoy your basket of treats! what a wonderful gift basket! enjoy! What a wonderful gift basket you got and from such a wonderful lady! It is perfect for those of us who are so fond of pink and all things wonderful!! I always enjoy stopping by your place - full of much eye candy and as well as candy for the soul. Talk about sweet! Thanks for such a great weekend, that! A little treat for good times and memories made. Thanks for the link back to my place! Now - I just picked up seven dinner and 6 bread plates of Ridgway Staffordshire England pieces in the Windsor pattern - in the green with dollops of red, blue, and gold in the floral and bird pattern. Love it for my Thanksgiving table. A thrifty find - but I would like to add to the collection now. I'll send photos via e-mail soon - could you and the man keep your eyes open for some?? What a lovely looking gift bag. So many scrumptious items--love it. What a nice gift! So, how are you enjoying that snow? Amazing...it's chilly here, but no snow yet!